Is PlaySega Worth Your Money? Sega recently launched a new website, =0&type=2>Playsega.com, which allows subscribers to play not only a wide variety of old school Genesis games, but also a number of original, flash-based web games. PlaySega.com, which costs users $5.95 for a month subscription, $14.95 for a three month subscription, $24.95 for a six month plan, or $34.95 for the one year plan. 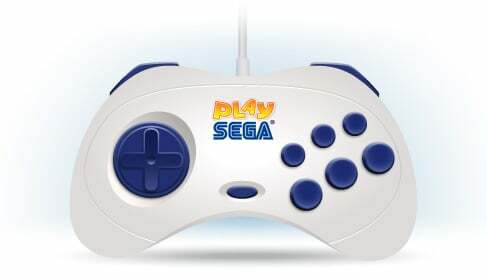 The best reason to subscribe is the PlaySEGA USB joypad (pictured below), which will come in the mail as a free gift to all of those who buy a 3-month or higher subscription. The controller will work with all classic games on the site, and will be shipped out to subscribers around mid-November. The controller, modeled after the six-button Genesis controller, is pretty awesome. I'm sure that creative types will think of numerous other gaming applications besides the PlaySega website so for $14.95 it's a great deal. Multiple joypads can be purchased separately, but the best idea would be to have friends also register for the 3-month subscription. Playing the new flash games on PlaySega earn players rings, which can either be spent on items for your avatar (stupid idea) or be used to enter the weekly $100 prize draw (good idea). The prize draw is a fun little concept, and I immediately entered it about 200 times after earning some rings while testing out the service. There are also Achievements that can be earned in each game, which is an interesting aspect except for the fact that none of these achievements are present in the Sega Genesis games, which I consider to be a huge oversight. I have to point out that Sonic's Ultimate Genesis Collection for Playstation 3 and Xbox 360 is available on Amazon.com for only $27.99, which is a fantastic deal. Those looking for Achievements or Trophies might wish to go with that deal instead of a subscription to PlaySega.com, but the free joypad makes PlaySega the better of the two options for me. New games are being added to PlaySega.com on a regular basis, so I think that the 3 month subscription that I just bought will turn out to be a pretty good deal. Hopefully others will decide the same thing and Sega can chalk up a win for once.